Pharmaceutical firms' direct marketing to doctors continues to cause prescription opioid deaths, a new study argues. The study, released Friday in the Journal of the American Medical Association, uses publicly available data from Medicare, Medicaid, and the Centers for Disease Control to match prescribing rates with prescription opioid overdose rates. Deaths from "Natural or semisynthetic opioids"—the CDC code which generally refers to deaths from prescription opioids like Vicodin or Dilaudid—totaled just under 15,000 in 2017. The study's authors note that while prescription pills are not the primary cause of opioid-involved overdose deaths—that distinction belongs to fentanyl, as well as heroin—they are usually the first opioids encountered by subsequent users of heroin/fentanyl. There were still almost 200 million opioid prescriptions issued in 2017, which the authors claim results in a rate three times higher than 1999. Further, they note, "Direct-to-physician marketing by pharmaceutical companies is widespread in the United States and is associated with increased prescribing of the marketed products." One in 12 doctors received opioid-related marketing between 2013 and 2015; that figure rises to one in five among family physicians. Direct-to-physician marketing was a key component of pharmaceutical firms' strategy to push pills to patients in the lead up to the current opioid crisis. The practice involves sales representatives approaching physicians, all-expenses paid trips to pharma-sponsored seminars on the benefits of prescription opioids, and even lucrative speaking gigs for those doctors who do the best job pushing a given drug. 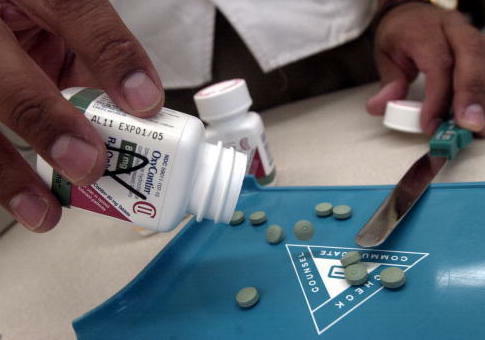 Purdue Pharma, the creator of OxyContin, reportedly compiled comprehensive profiles of physicians to better target them and offered enormous bonuses, up to a quarter of a million dollars, for sales representatives who sold directly to major prescribers. A Senate report released last year found that five opioid manufacturers in five years alone spent $9 million in support of "patient advocate" groups responsible for downplaying the dangers of opioids to physicians. As such, the new JAMA study's authors wanted to test the link between marketing, prescription rates, and prescription opioid overdose deaths. The Physician Payments Sunshine Act mandates disclosure of payments—usually in the form of meals, travel costs, speaking fees, and consulting fees—from pharmaceutical firms to doctors, including information about the drug being marketed. The authors combined this data with prescribing and death data to get a county-by-county picture of the nation from 2013 to 2016. They then built a model, controlling for a number of confounding socio-demographic variables and looking at the connection between marketing in one year and overdose deaths in the subsequent year. Three different measures of marketing—value in dollars, number of payments per doctor, and number of doctors being paid—were strongly associated with an increase in both prescription rates and subsequent prescription overdose deaths. The study's authors also performed a "mediation analysis," concluding that increases in prescribing rates significantly mediated the association between marketing and deaths. What the study means practically is that the millions of dollars pharmaceutical firms spend annually on marketing directly to doctors are causally linked to increased prescription rates, which are in turn linked to addiction and eventual overdose death. At the same time, it is not clear that reductions in opioid prescribing rates will actually curb the crisis. The study focuses on deaths from prescription opioids, but past research indicates that the modification of prescription opioids to make them abuse-resistant simply resulted in an en masse switch to heroin among people who use. In other words, if the supply of prescription opioids fall, people who use will likely simply choose to abuse more dangerous opioids—including pills and heroin likely adulterated with fentanyl. "Reducing the number of opioids prescribed is only one facet of a much-needed, multipronged public health effort to reduce opioid-related harm," the study's conclusion emphasizes, "and is unlikely to reduce the current high mortality from overdoses that are attributable to heroin and illicitly manufactured fentanyl."